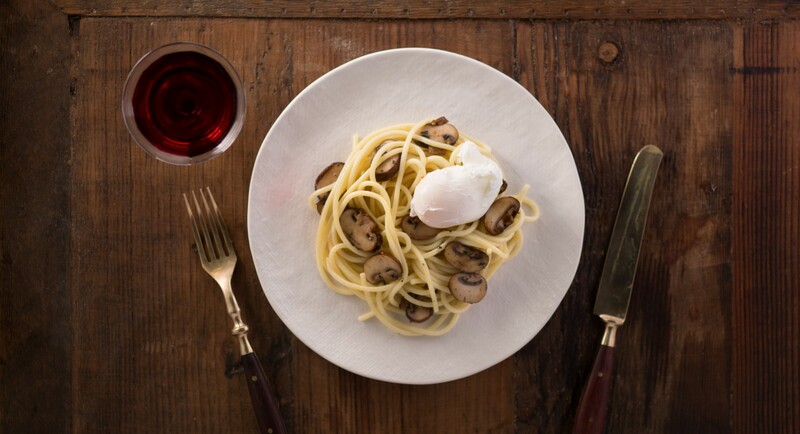 Fragrant rosemary and tender mushrooms shine in this simple pasta recipe. Topped with a poached egg, this dish makes a tasty yet deceptively easy dinner. Fill a pot with salted water and bring to a boil. Cook spaghetti according to package instructions. Heat ghee in a large skillet and sauté rosemary until fragrant, 1 minute. Add in mushrooms and sauté until tender. Fill a sauce pan with 3 inches of water and bring to just a boil. Pour in vinegar. Using a whisk, vigorously swirl water until a vortex forms in the center. Crack 1 egg into a ramekin and slide egg into vortex and continue to swirl water with whisk around edges of pan until it returns to a boil. The egg white should wrap tightly around the yolk, forming an oval shape. Cook 3 minutes. Remove from water with a slotted spoon and repeat with other eggs. Drain cooked pasta from water and mix into mushroom mixture. To serve, divide between four plates and place egg on top. Season well with salt and pepper.